It is not a mystery to score 70+ marks in SBI Clerk 2018 prelims if you have a proper study plan and exam strategy. First of all, you should be aware of strong and week topics and work accordingly. Before knowing the strategy to score 70+ marks you must know about the exam pattern and analyse various topics to know their weight in the exam in our previous articles. 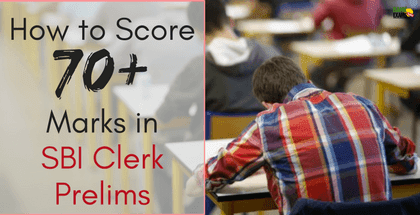 In this article, Let us discuss the strategy to score 70+ Marks in SBI clerk Prelims. In the first round try to attend questions from Quadratic equations, Approximation/ Simplification, Number Series, and Misc topics. According to last year pattern, 20 questions were from above-mentioned topics. Try to finish the first round in 10 minutes, which will fetch you 18 to 20 marks with 100 percent accuracy. Now, remaining 15 questions will be word problems. Choose the questions from the topics with which you are familiar. Try to attend at least 8 to 10 questions out of remaining 15 questions. Practising this section by above-mentioned strategy, definitely, you will score 26 to 30 marks. To increase your speed and accuracy, you must be clear in the concepts and practice at least a sectional test daily. In the first round try to attend non-puzzle questions such as Inequalities, Coding and Decoding, Alphanumeric series, Syllogism, Direction and blood relation questions. According to last year pattern, 25 questions were from above-mentioned topics. If you are too good at Reasoning then it will be easy for you to attend 25 questions in 10 minutes. Even if you are average, you can attend 25 questions in 15 minutes with proper practice. In the second round attend puzzles and Seating arrangement type of questions, which may be asked for 10 marks. To score maximum Mark in the second round choose the comparatively easy puzzle and do it first. If you have time after solving it, then go for a tough puzzle. Try to score 5 to maximum 10 marks in the second round. Great!!! You will score minimum 28 to maximum 35 marks by using the above strategy properly with a lot of practice before the final exam. One of the scoring section of prelims exam is English Section. If you have good command over the language, then you can score maximum Mark. Due to the separate timing for each section this time, it is obvious that you have got few more minutes for this section. If you are a weak in grammar part, then it is wise enough to attend the Reading comprehension and Jumbled paragraph first and then go for grammar part. If you are good enough in grammar part, then do grammar-related questions like error detection, Cloze test, fill-ups first and then attend Reading comprehension and Jumbled paragraph. Skip those questions you are not sure about. Try to score 18 to 22 marks in this section. If you want to improve your English knowledge, you can join our 60 days English course, which will be very useful for you to score maximum Mark in English Section. By using the above strategy, one can easily score 70+ marks. This cannot be obtained on the very first day. You have to prepare and study the concepts clearly to improve your accuracy. Practice regularly to improve your speed. Unless you practice, it remains a mystery to obtain 70+ score. Moreover, if you Elevate yourself for prelims, you can clear it easily and also it will help you in phase II exam. Be a warrior to face the exam by sharpening your sword. Kindly use the above strategy in mock test before your exam as many times as you can. If you have any doubt regarding preparation or exam strategy, you can comment below without any regret.